The NFL has been long-known for manipulation of science and use of intimidation tactics but never has this been more evident than in a motion filed on March 20, in the Concussion Settlement. Allegations of bully tactics, doctor manipulation, and cherry-picked science are revealed in the motion filed by Locks Law Firm in an attempt to put the settlement back on the track it was purposed for – that of compensating injured retired players and their families who are suffering devastating effects of brain damage as a result of their football careers. 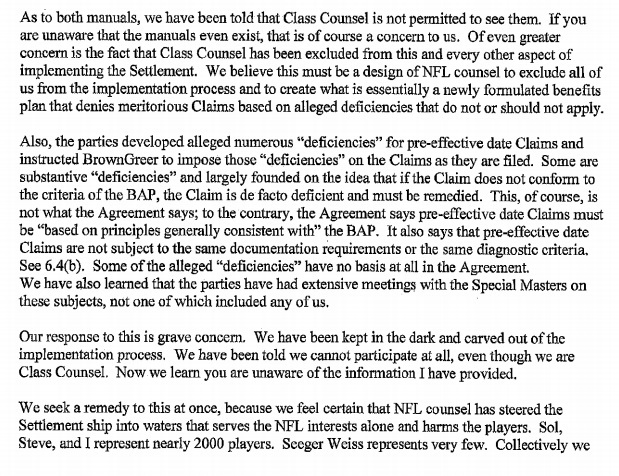 The motion asserts that the “NFL is trying to rig the claims system” and engaging in the “scorched earth tactics” that it is well known for. The result to players and their families is devastating. The NFL has tried to obfuscate the correct standard of review by the AAP of pre-effective date claims, and some [appeals panel] members do not follow the proper standard. 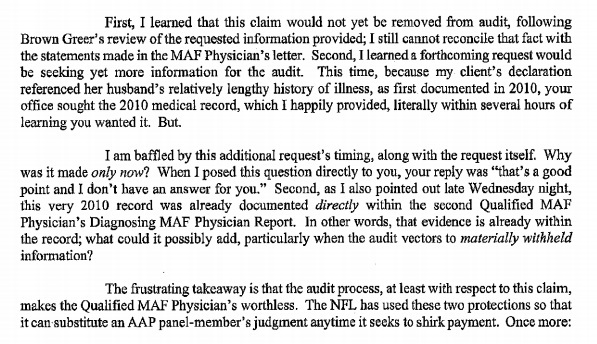 The NFL is using its audit right as a second appeal weapon for the purpose of defeating approved claims via an anonymous and secret procedure. 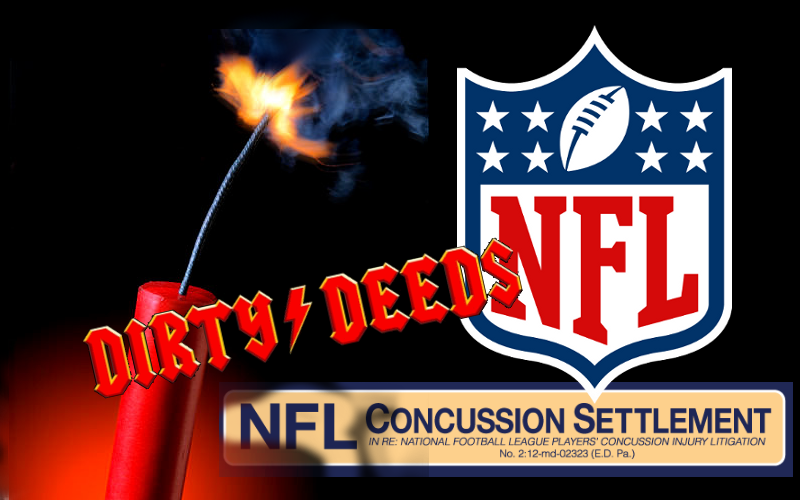 The NFL is engaged in vexatious, frivolous and bad faith appeals in violation of Settlement Section 9.6(b). [Claims Administrator] BrownGreer has been forced to [or agreed to] apply rigid BAP criteria to pre-effective date claims in violation of Settlement Section 6.4 (b). This constitutes an unannounced amendment to the Agreement. The third-party affidavit that is supposed to corroborate functional impairment in a player diagnosed with neurocognitive impairment (dementia) has also been the subject of an unannounced Amendment. The AAP is paid below market rates; it must double in size. Keeping it underpaid and small prejudices the Class and benefits the NFL with delay. The NFL has in bad faith prevented outstanding cognitive and behavioral neurologists from joining AAP to prejudice the Class. The BAP as implemented is failing the players. On information and belief, a de minimus number of players have received awards through the BAP and most are rejected. Medical professionals have left the BAP or refused to be part of it. At this juncture, obtaining appointments for players takes three to six months. The BAP neuropsychological is inherently biased against African American retired players, which makes it more difficult for approximately 70% of the Class to recover in the Settlement’s compensation system. The brief describes a case, the progression of which appears to be typical in the Settlement. A 41-year-old player had a decade-long history of neurological decline which included numerous neurological tests that revealed amyloid plaques – a marker for Alzheimer’s disease. His medical records also included neuropsychological tests including one by a neuropsychologist employed by the New York Giants; all of these tests indicated neurological impairment. His claim was approved and on the last day the NFL could appeal, they did. When the player won the appeal, the NFL placed his claim in audit to avoid payment and seek another means of discrediting the claim. Exhibits filed with the motion show correspondence between the player’s attorney and the Claims Administrator that completely support the allegations. According to the brief, the NFL has gone so far as to demand a differing diagnosis from appeals panel doctors than the one rendered by physicians who physically examined the player. 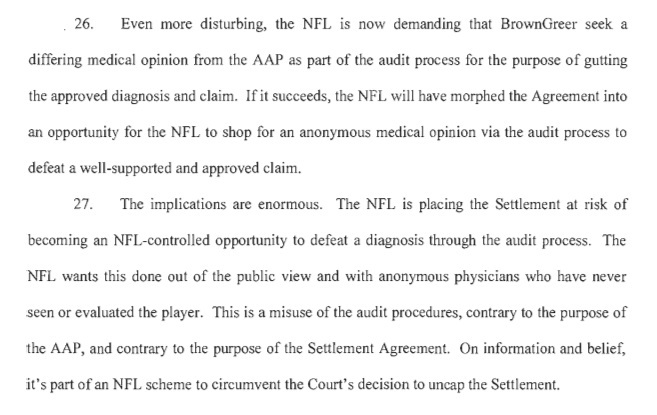 The case which was brought to court in which NFL players accused the League of defrauding them has through the NFL’s devious schemes been turned completely upside down in that the NFL is discrediting legitimate medical records and once again (as they have done in the disability process) accusing the injured players of attempting to defraud them. All in all, the motion with exhibits comprise 82-pages of evidence of manipulation and deceit on the part of the NFL, and while not formally accused of wrong doing, Seeger’s complicity must be questioned regarding his inability or unwillingness to halt or at least openly fight what the NFL has done to corrupt the Settlement. It is evident that other attorneys have gone to Locks (and probably other class counsel) when they have been unable to get problems addressed, only to learn that class counsel not named Seeger have no more access to the ever-changing processes than they do. Some attorneys have filed motions as an attempt to address the problems and have met with joint opposition on the part of Mr. Seeger and the NFL, with Judge Brody ruling in favor of the latter for reasons that are unknown and difficult to comprehend. In response to a Washington Post query, the NFL has denied all the allegations set forth in the motion, however this should come as no surprise to anyone familiar with their modus operandi. It has been established time and again that the NFL has engaged in big tobacco style deceptive research, and one need look no further than their attacks on Dr. Bennet Omalu when he discovered the football/CTE link, to see how far they will go in attempt to discredit and humiliate doctors. According to an anonymous source, one doctor of immaculate credentials from a major teaching university left the BAP program after being pressured to avoid giving 2.0 neurocognitive impairment diagnoses if any diagnosis at all. He felt he was being pressured to alter test results and being impeded from being able to practice medicine in an ethical manner. This narrative is very consistent with the information included in the motion. Because of the numerous problems and corruption of the Settlement program, Locks Law, in the motion has pled for administrative control of the Settlement in order to return it to its purpose of compensating impaired retired NFL players. I expect that Seeger will oppose the motion although he is now involved in at least two additional MDL proceedings – an opioid lawsuit and the Proton Pump litigation to which he has been appointed as Co-Lead Class Counsel once again. Since Judge Brody has not ruled against Chris Seeger since the Settlement became final, it will be interesting to see if she breaks with the status quo and rules favorably, or inexplicitly rules in favor of Seeger once again. Much hangs in the balance.